Place the ciabatta slices under a preheated hot grill and toast each side until golden. Make a couple of incisions on one side and rub with a garlic clove then drizzle over olive oil on each side. 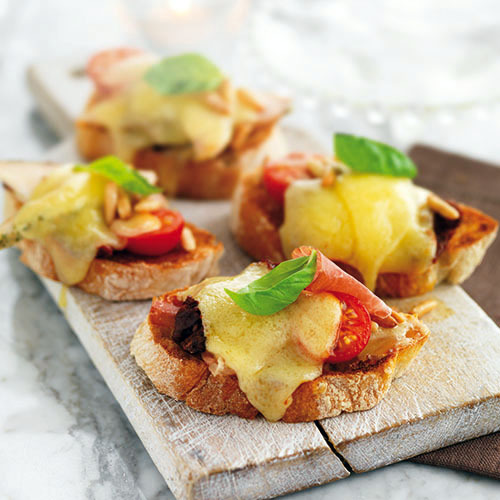 Top the ciabatta slices with sundried tomatoes, cherry tomatoes, Applewood® Smoked Cheddar Cheese, Parma Ham or Smoked Turkey. Place under a preheated hot grill for 3-4 minutes or until the cheese has melted. Serve straight away. Garnish with pine nuts and basil leaves.